Size: 6.5" x 4.8" x 0.85"
The TI-81 ViewScreen panel is connected with a flat-ribbon cable permanently to a modified TI-81 graphing calculator. Placing the panel on a raised platform with an additional lens on the overhead projector enlarges the image of the handheld screen so that each student can follow along. The used platform was in the 90s commercially available from the Polaroid Corporation to project Polaroid color-graph type 691 overhead transparencies. Dismantling an early TI-81 ViewScreen manufactured end of 1990 reveals no surprises. The reflective background surface was removed from a standard TI-81 graphic LCD display to achieve a transmissive characteristic. The remaining circuit looks really straightforward and consists of two Toshiba T7778A column drivers and one T7900 row driver. 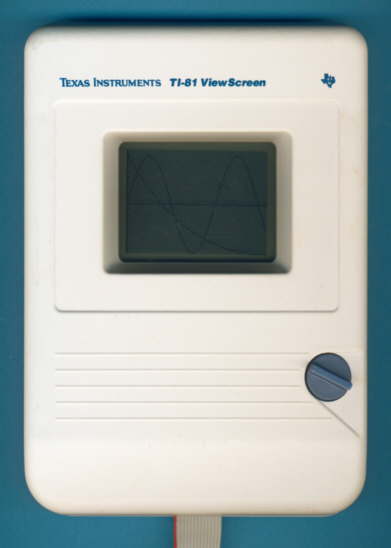 Don't miss the similiar TI-85 ViewScreen connected to the first generation TI-85 VSC. © Joerg Woerner, February 12, 2009. No reprints without written permission.